Use these simple parking instructions when visiting our store. Parking around the Capitol is a tricky proposition when the legislature is in session from January to May. This is especially true for the next couple of years as the Capitol dome’s construction annoyingly requires legislators to take parking from nearby side streets. Since we are across the street from the Capitol, we also use that parking. But fear not Capitol Hill Books’ customers. We have a handy guide for parking during the legislative session. First remember that you cannot park at any of the parking meters that have a yellow bag over them during the week. This includes parking holidays as apparently the legislators do not take those days off. However, during the weekends parking on both sides of Grant Street is free including the bagged meters. And on Sundays, all meters are free including the ones on Colfax. 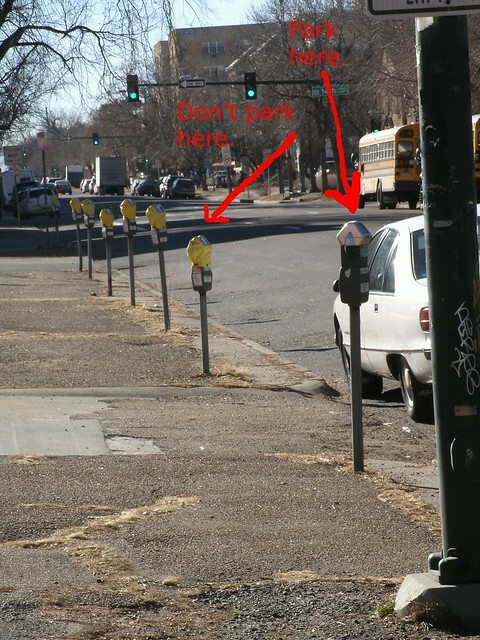 Parking during the week is trickier, but there are three meters on the east side of Grant Street and several meters along Colfax that are available. We also have a loading zone available on Grant Street, just south of Colfax that is available for customers to quickly pick up a book or to drop off a book trade. You shouldn’t park there for more than a minute or two without risking a ticket, but if you’re quick, you should be OK. And if you are thinking about staying awhile in the Capitol Hill area, there is a paid parking lot behind our store. We know that this is a bit difficult now for our customers to find parking around our store but we do appreciate your support of our store and please feel free to call us at 303.837.0700 if you have any questions about parking. This entry was posted in Uncategorized and tagged Capitol, Capitol Hill Books, Legislative Session, Parking. Bookmark the permalink.